1. Cheers Bottle Bag, $14.95. Love this fancy and fun (and eco friendly) wine bag. Ideal for your holiday celebrations. 2. Moroccan Glass Cups, $14 each. The prettiest cups to place atop your bar cart. These Moroccan highball glasses are perfect for tea, cocktails and even casual wine drinking. 3. Mid-Century Bar Cart, $279. Because everyone needs a bar cart. 4. Swell Bottle, from $21.25. The 25 oz one holds an entire bottle of wine! 5. Gold Ice Bucket, $89. For the entertaining souls, nothing tops a gold ice bucket. 6. Gold wine key, $14.99 (and available at 3 Parks) I'm always the talk of the party when I open bottles of wine with this gold opener. 7. The Wine Bible, $24.95. The 2nd edition has just been released 14 years later and it's ideal for anyone who wants the perfect introduction and crash course to wine. It's a household must have. 8. 'Let's Get Wine Drunk and make out' Card, $4.99. (and available at 3 Parks) The best card ever! Everyone should get this card over the holidays. 9. Food & Wine and Imbibe subscriptions, from $12. Perfect coffee table magazines for the food and wine or beverage lover. 10. Coravin Model Two Wine System, from $349.95. This gift is for the wine lover in your life. You're never really opening the bottle and you can come back to it over and over again. 11. Two Bottle Bag, $18.95. What's better than one bottle of wine? Two! 12. Vintage French coupe glasses, $48. My go-to glass when I'm entertaining. 13. Peach Dish subscription, from $45. If you're a lover of wine, you're probably a lover of food. Peach Dish is hands down my favorite meal delivery kit. Pick two meals, receive your box (which includes all the ingredients), open a bottle of wine, then cook an insanely delicious meal. It's so fun! 14. Cocktail book, $19.95. 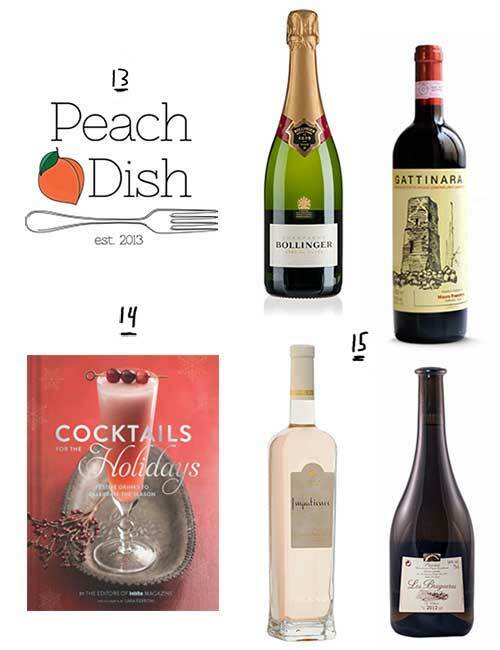 I love this pretty book of pretty holiday cocktails- from bartenders all over the world. 15. Impressive Holiday Wines. Quality champage, from $75. RED WINE: Mauro Franchino Gattinara, Italy. 100% Nebbiolo. This is a wine that you pull out of your secret stash when you want to impress your friends. Make sure you open it at least an hour before drinking or decant. $44.99 at 3 Parks Wine Shop. WHITE WINE: 2012 La Conreria d'Scala Dei Priorat Les Brugureres, Spain. This is my go-to winter white wine. The wine is full, rich, complex and badass. And did I mention the vines are 110 years old! $32.35 at 3 Parks Wine Shop. ROSÉ WINE: 2014 Chateau De Berne Impatience Rosé, Provence, France. It's a Rosé in a beautiful square bottle that tastes ridiculously amazing. $19.50 at 3 Parks Wine Shop.